The William Angliss Placement Program Lunch was held on Tuesday 12 June 2018 12pm – 3pm at the Angliss Restaurant. The Placement Program is a valuable experience for a select number of events and tourism students to work 1-2 days a week in successful companies within these industries. The lunch is held at the conclusion of the program as an opportunity for all students and placement partners to get together and share an insight into their unique experiences. 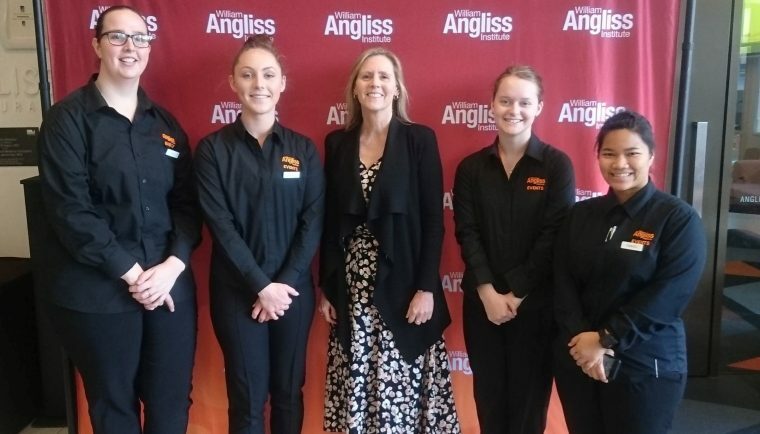 This was the first year the Placement Program Lunch was held in the Angliss Restaurant and was run by a team of Diploma of Event Management students, Mr. Fox Events. As part of our function subject we were placed in groups. The name of the group was Mr. Fox Events. We worked closely alongside our client Corinne Maxfield to create this event. The theme this year was elegant and classy. Our Stylist created centrepieces, table settings and menus that portrayed this theme in a neutral colour palette perfectly, as shown in the photos below. The Beverage Coordinator was in charge of creating a customised mocktail to suit the demographic and theme of the function. The mocktail chosen was a Ginger Peach Soda, as shown in the photos below. The Front of House Coordinator and Administrator were in charge of managing the hospitality team to ensure service was performed at the highest possible standard. 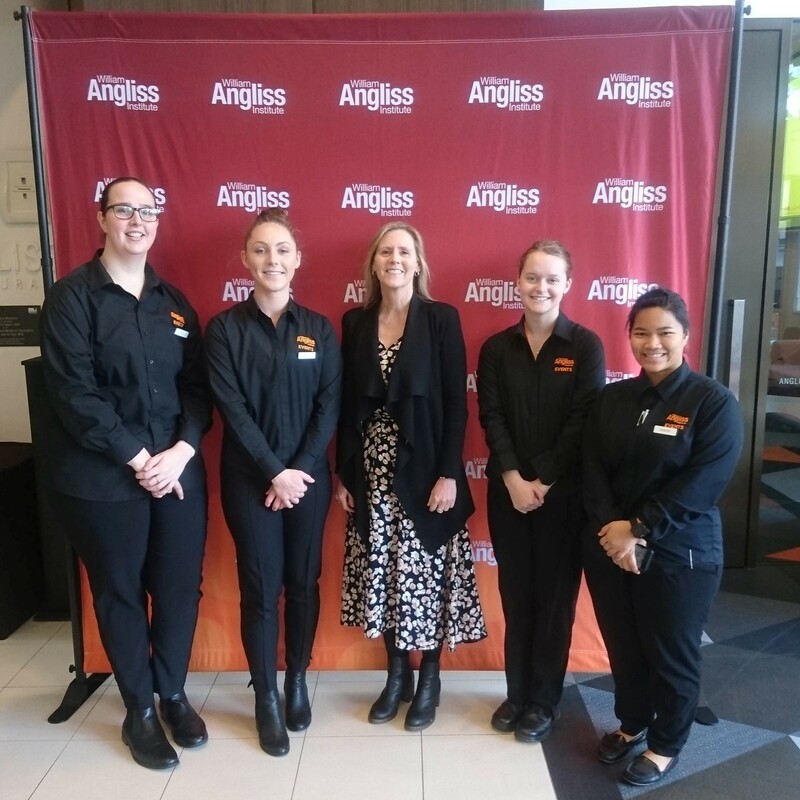 At the pre-lunch reception set up in the restaurant foyer we had a professional photographer from the Marketing department there to take photos of our students and their partners to be posted on the William Angliss website to share with all guests. We had almost 50 guests in attendance, we began the day with a welcoming speech by the Placement Program Coordinator, Julie Rayner, followed by a delicious main course served by the hospitality students. Shortly after the main course we arranged for a wonderful choir performance of “Ngarra Burra Ferra” sung by the aviation students. Following this we had each of our events and tourism students make a short speech allowing them the opportunity to speak, share their experiences and thank their placement partners and the companies they worked at for the valuable lessons learnt during their placement. Once the speeches ended the dessert course was served and shortly after the function concluded. Overall, the whole event, overseen by Mr. Fox Events, ran smoothly and on time from start to finish. All guests seem to enjoy the food, atmosphere and the function in general. We received lots of positive feedback from our guests and our client was very impressed by our performance throughout. Managing this function was a great learning experience for us moving forward in the Event Management course and also to develop new skills and knowledge to become successful in the events industry.